My goal is to demystify and make the process of install of filter drivers simpler. I spent time in this blog describing install issues, driver signing and some miscellaneous topics like PCI express capabilities. I will go into more depths of bus and class filter drivers in my next blog. In this blog I tackle the issues of deploying, debugging, signing filter drivers and small tidbits on PCI express capability structure defined in the PCI spec. There are lots of general guidelines in the Windows Driver Kit(WDK) on how to write filter drivers. 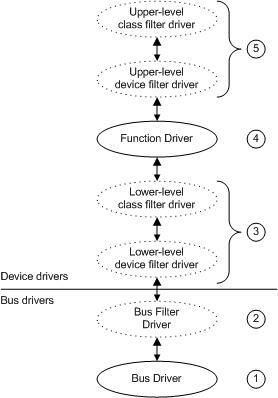 The figure below shows types of filter drivers and where a filter driver can be in the device stack. The toaster filter driver in the WDK is a good starting point: http://msdn.microsoft.com/en-us/library/ff558716(v=VS.85).aspx The toaster sample set is huge and shows how to write different types of filter drivers – upper/lower class, bus and device filter. The filter deriver I recently wrote was a PCI bus filter driver and a USB class filter. Among other things the challenge was debugging and installing it. Bus filter drivers typically add value to a bus and are supplied by Microsoft or a system OEM. Bus filter drivers are optional. There can be any number of bus filter drivers for a bus. A bus filter driver could, for example, implement proprietary enhancements to standard bus hardware. For devices described by an ACPI BIOS, the power manager inserts a Microsoft-supplied ACPI filter (bus filter driver) above the bus driver for each such device. The ACPI filter carries out device power policy and powers on and off devices. The ACPI filter is transparent to other drivers and is not present on non-ACPI machines. Debugging the pci bus filter – USB is not a great means for debugging it as the USB controllers which are PCI devices didn’t do too well when my filter driver hit a bug. That’s why resorted to 1394 and serial. I all my initial development and debugging on a desktop with serial ports and then started testing on a laptop. Inf file The install is challenging in how you need to write the inf file and then how do you install the filter driver. The places where this inf differs from a regular function drivers inf is the key to specify whether this is an upper or lower filter. Since this is a PCI bus filter it has the needs and Include directive as well since it is dependent on the PCI bus driver. Note the driver is a boot start since it is a PCI bus filter. It also uses the System class. The highlighted part in bold below is the one unique to filter drivers. You will need to reboot the system after install. You will need to enable test signing to install the filter or sign it. levels in the Setup logs to look at the Setupapidev.log . usbcfltr, look for that in the registry and rename it. The attachedDevice field in the DEVICE_OBJECT structure points to the guy above him in the stack. This is a common operation for writing filter drivers. referenced pointer to the PDO. The following link describes the steps involved. The basic steps are outlined below with examples. Note the example just show one way of doing it and not the only way. You will need the WDK installed to use the tools for this. Copy all the files to a folder which includes the .sys file, the inf file and any coinstallers like wdfcoinstaller01009.dll etc. This entry was posted on August 29, 2011 at 8:24 pm and is filed under Windows Drivers. You can follow any responses to this entry through the RSS 2.0 feed. You can leave a response, or trackback from your own site. I’m in the process of developing a simple PCI bus [upper] filter driver as well — any way you could share your source for development purposes? I seem to find the programming somewhat easy, but actually installing the driver via the INF file is actually the part giving me the most trouble. I’m hoping to have at least a working source base to get started with and slowly keep substituting+testing my code parts at a time.